There are three interesting things about The Magnificent 7 remake. Two embody everything that makes generational remakes like this worthwhile. One demonstrates just how badly they can go wrong. The film’s strongest point is its cast. Antoine Fuqua is a phenomenal director and there’s something worth watching in everything in his back catalogue. The gunfight/duet in The Replacement Killers, the unit psychology in King Arthur and every single second Denzel Washington is on screen in Training Day all spring to mind. Here he combines all of those things and uses them to make an old recipe with some new ingredients. Washington subbing in for Yul Brynner is a choice as inspired as it is logical. The fact Chisolm is a marshal and a licensed bounty hunter emphasizes that as does his understanding of Comanche culture. This is a man who is different to everyone around him in every single way and Fuqua spends the entire movie exploring those differences. That subversion of expectation is what makes the rest of the cast work too. Vincent D’onofrio’s bear-like trapper, Jack Horne, is both a mass murderer of native Americans and a quietly spoken man of God consumed with grief. Ethan Hawke’s Goodnight Robicheaux is a preening southern gentleman, a decorated sniper and coasting off a reputation he believes has damned him. There’s also a clear implication that he and Byung-hun Lee’s excellent and under-utilized Billy Rocks are romantically involved. This is, for the first two thirds of the movie, a more diverse, nuanced and interesting Wild West than we usually see. PTSD is the eighth member of the team and Chisholm, Horne, Robicheaux and Faraday all fight it with more desperation than anything Peter Sarsgard’s sketched in, apathetic villain throws at them. Robicheaux and Faraday, and their struggles with their past, are the second place where the movie impresses. Robicheaux is a rambunctious charmer who is convinced he’s damned. The way in which that’s revealed, and the gentle, compassionate way that Billy covers for him is a moment of genuine poignancy and implies far more to the relationship between the two men. It’s a shame the film didn’t make that implication overt, as it would only have helped. But it’s Pratt’s Joshua Faraday who is the film’s biggest surprise. Hollywood’s emergency golden retriever has made a career out of scruffy, slightly rubbish heroes who buy into their own hype far more than those around them do. It’s a good niche for him but for a while there it was starting to look like a rut. 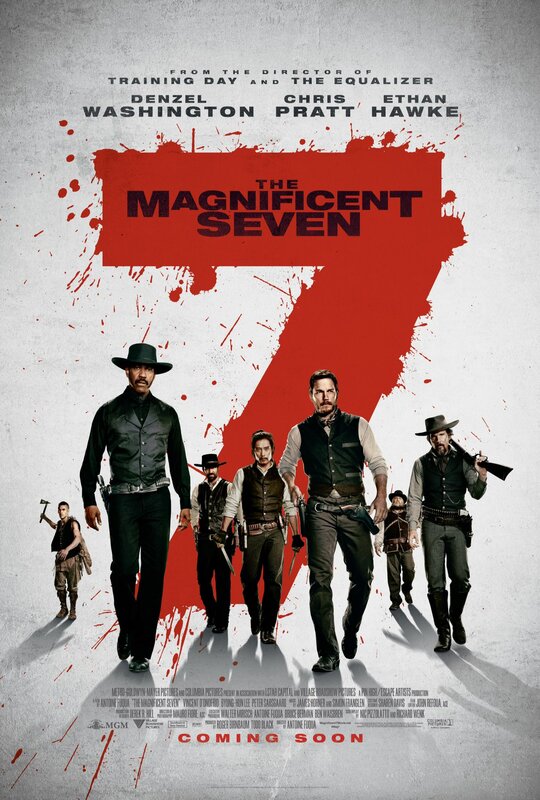 His initial appearance in Magnificent 7 reinforces that; cheating at cards with the same stream of consciousness wit and self-preservation that makes Star-Lord so much fun. Then, Faraday is ambushed by two men he cheated a few towns over. He murders one and maims the other. That’s the North and South of the character and Pratt swings between them with wild, increasingly fatalistic abandon. Faraday has all the best jokes in the movie but also has moments of dead-eyed brutality. A ‘lesson’ in shooting with one of the Seven’s clients is presented as Faraday looking for whiskey and a fight in that order. A later scene where he tries to shame Goodnight into revealing his weakness plays as straight up cruelty. But it’s the single moment he shares with Emma Cullen, the women who hires them, that’s the movie’s high point. In that instant, you understand the man. He’s as broken as Goodnight but where Goodnight hides it behind his charm, his reputation and Billy, Faraday can’t stop picking the scab. He drinks endlessly to dull the pain, he picks fights to stop it. Other members of the group are looking for a good death. Faraday will take any death he can get and, when it comes, it’s as showy and flamboyant as the man himself. The film works best, like Faraday, when it’s misbehaving. Unfortunately, like Faraday, it’s not consistent. While the ending is as impressive, and practically shot, as anything Fuqua’s done the film fails to do right by the rest of its cast, opting instead to fall back on familiar and tedious tropes. Lee’s Billy and Manuel Garcia-Rulfo’s Vasquez have very little to do despite being two of the more charismatic members of the cast. Martin Sensmeier’s Red Harvest, the Comanche member of Chisolm’s posse, has more lines in his introduction than the rest of the movie. Worse still, Haley Bennett’s Emma Cullen is reduced to little more than an inciting incident with dialogue. The America/Mexico conflict, the bloody history of the colonists’ interactions with the native population and the role women played are all areas rife for narrative exploration and these characters are all paths to that exploration. The film ignores all of them, instead opting for a final act that damages Chisholm as much as it builds him up and gives one female character agency at the expense of two others. It’s a bad deal and one that the film really shouldn’t have ended on. Especially as everything that came before it is so well handled. There’s way more to enjoy here than we had any right to expect and Washington and Pratt alone make it a worthwhile trip. It’s just a shame that what starts out as a different journey to a familiar destination ends up going down such worn, tired paths.